This recipe is from the back of the bag of Reese’s Peanut Butter Chips (see picture below). The cookie is fabulous. It’s like a peanut butter cup in cookie form. My daughter made these cookies for a “Back of the Box” themed Cookbook Club meeting. She loves peanut butter. She saw the chips. She read the recipe on the back of the bag. She made the cookies. Everyone swooned. End of story. Well, not quite the end of the story because now I’m posting the recipe, as is, lifted right off the back of the Reese’s Peanut Butter Chip bag. You’ve just read the recipe and my swooning review. 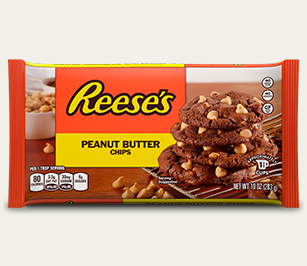 You are going to go out to get a bag of Reese’s Peanut Butter Chips. You are going to make the cookie. You and yours will swoon. You’ll go down as one of the best cookie bakers EVER! Beat butter and sugar in large bowl with mixer until fluffy, 3-5 minutes. Gradually add flour mixture, beating well. Stir in most of the peanut butter chips. Hold out some peanut butter chips to decorate the tops of the cookies before baking. Drop by rounded teaspoons onto ungreased, preferably parchment lined, unrimmed cookie sheet. If desired, press 2, 3, or 4 peanut butter chips onto the top of each cookie. 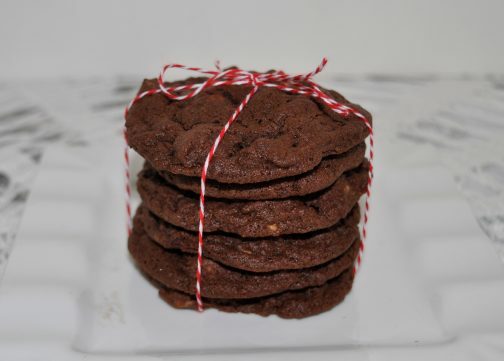 Makes about 4 dozen cookies, but depends on the size of your cookie. In my (albeit, limited) experience, it seems most back-of-the-box recipes sound good but in reality are quite plain and quite bland. There are 10 good ones though! Toll House Chocolate Chip Cookies, Philadelphia Cheesecake, Alber’s Cornbread, Rice Krispie Treats, Lipton Onion Dip jump to mind. Pssst…! And now I have found another one! It’s on the back of the bag of Dutch Process cocoa powder that I purchased at Costco (brand name: Rodelle Organics). 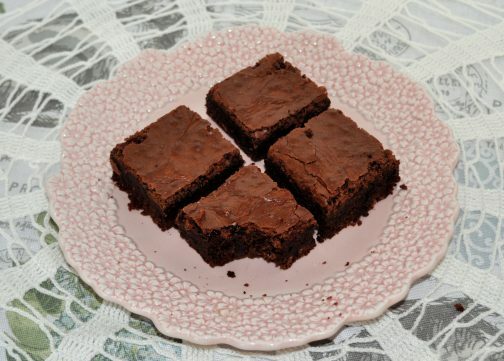 These brownies are delicious, and just my type of brownie. Everyone seems to have their own preferred brownie type, right? This is mine. Slightly crunchy top, oh-so-chocolately flavor, dense-but not fudge, light-but not cakey. These are just right! AND, they’re easy-to-make, and one batch fills a 9×13 pan! The brownies slice well, too. What more could one want? Line 9×13 inch baking pan with parchment paper and spray lightly with cooking spray. Melt butter and sugar in a heavy saucepan on very low heat. Let the mixture slightly cool and transfer to a large bowl. Beat well. Add eggs, gradually, mixing well. Add dry ingredients to egg mixture, stirring gently and minimally. Pour mixture into prepared pan and bake approximately 35 minutes. Do not overbake. Weekend Cake! Isn’t that a delightful subcategory of dessert? 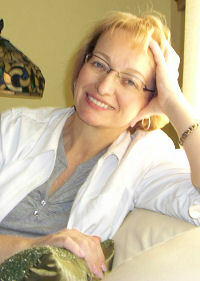 According to Dorrie Greenspan it’s a French concept. Weekend Cake is good for anything from breakfast through late night snacking. Weekend Cake travels well, is long lasting and is best if left to sit a day before eating. This recipe for Double Chocolate Marble Loaf, a “weekend cake” is from her cookbook, “Baking Chez Moi” . 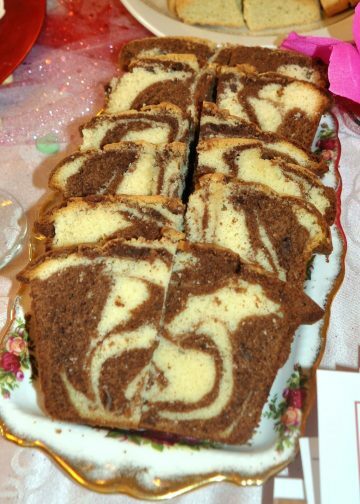 I’ve never been much for Marble Cake, often finding it to be dry and muddled. Not this one! It’s truly delicious. I’ve only made the orange chocolate-white chocolate version, but I am dying to make the mocha-cardamom version and the chocolate-mint version. Center a rack in the oven and preheat the oven to 325 degrees. Pull out an insulated baking sheet or stack two regular baking sheets one on top of the other. Line the (top) baking sheet with parchment paper or a silicone baking mat. Butter a 9-by-5-inch loaf pan, dust with flour and tap out the excess; set it on the baking sheet(s). Working in the bowl of a stand mixer fitted with the paddle, or a large bowl with a hand mixer, beat butter on medium speed for 3 minutes, or until smooth. Add sugar and beat for another 2 to 3 minutes, scrape sides. Add the eggs, one at a time, and beat for a minute after each one goes in. The batter may curdle, but you needn’t worry. Reduce mixer speed to low and mix in the vanilla. Still on low speed, add the flour mixture in 3 additions and the milk in 2, beginning and ending with the dry ingredients and mixing only until each addition is incorporated. Scrape half of the batter into another bowl. Using a flexible spatula, gently stir the white chocolate into half of the batter. If you’re using the orange oil, stir it in as well. Stir the dark chocolate into the other half of the batter. Using a spoon or scoop, drop dollops of the light and dark batters randomly into the prepared pan — don’t think too much about the pattern — and then plunge a table knife deep into the batter and zigzag it across the pan. It’s best to move forward and not to backtrack. Don’t overdo it — 6 to 8 zigzags should suffice. Bake the cake for 80 to 90 minutes, or until a tester inserted deep into the center comes out clean. (My cake was done in 70 minutes, and I might have taken it out 5 minutes sooner.) Check the cake at the halfway mark, turn it around and, if it’s getting too brown, cover it loosely with a foil tent. Transfer the cake to a cooling rack and let it rest for 10 minutes, then unmold it, turn right side up on the rack and let come to room temperature. Storing: Wrapped well, the cake will keep at room temperature for up to 4 days. It can be wrapped airtight and frozen for up to 2 months; defrost it in its wrapper. Spiced Mocha Variation: add 1 tsp. ground cardamom into the white chocolate portion and 2 ½ tsp. instant coffee or espresso mixed with 1 T. hot water to the dark chocolate portion. Omit the orange oil. Mint Chocolate Variation: stir ¼ tsp. peppermint oil into the white chocolate portion and use only regular semi-sweet or bittersweet chocolate in the dark chocolate portion. Omit the orange oil.